Don't miss out on the following promotion(s)! Choose PICK UP & be REWARDED! Try our limited edition Pink Pink Sakura Meal before it’s gone! Meal consists of 1 limited edition Pink Pink Sakura Maki, 2 slices of Sakura cake & 1 Pink Qoo drink. Image is for illustration purpose only. The cherry blossoms are blooming and Sakura season is booming. So celebrate it with our Sakura cake today! Not sure what to order for one? It's simple! Just pick from our house favourites to put together a wholesome meal. Now with 1 house maki roll or salad, a freshly fried snack and 1 soda of your choice. A combination of the best of both worlds, now with 1 house maki roll, 1 house salad, paired with freshly fried tempura and 2 thirst-quenching sodas of your choice. Triple your delight with 3 house maki rolls, paired with 2 of our crispy tempura snacks and 3 chilled sodas of your choice. It's as easy as 1-2-3 to order our ever-popular meal that comes with 2 house maki rolls, 1 house salad, 2 delicious tempura snacks and 3 refreshing drinks of your choice. Got the hungries? No worries as our popular feast of 5 house maki rolls, 3 juicy & crispy tempura snacks plus 5 thirst-quenching sodas of your choice will definitely fill up your hungry tummies. Big appetites can now rejoice with our crowd favourite feast of 3 house maki rolls, 2 house salads, 3 tantalising tempura snacks and 5 refreshing drinks of your choice. Throwing a mini party? We have just the right MakiParti platter for you! 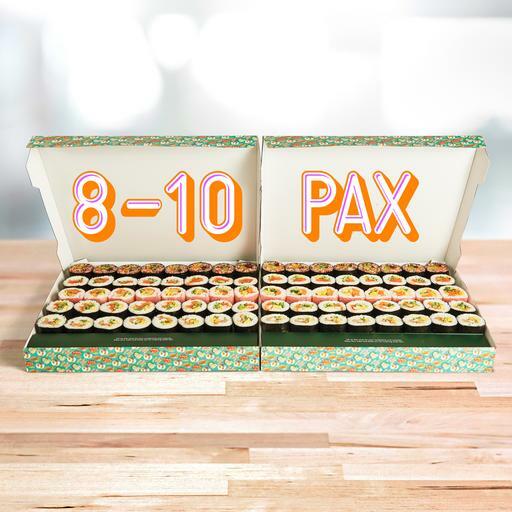 You can choose 5 of your favourite house maki rolls and we'll bring the party right to your doorstep! Organising a get-together? Let us bring the party right to you! With these 2 MakiParti platters, you get the best value because you can choose 10 of our best-selling house maki rolls to form your own platter! Love seafood? This is the perfect MakiParti platter for your party because you get to enjoy wave after wave of our popular seafood house maki rolls! Meat lovers rejoice! This is the MakiParti platter that you will simply claw into because you get to delight in our best-selling meaty house maki rolls! Our best-selling tempura snack that's juicy and crispy at the same time, you'll definitely love it too! A delightful combination of freshly prepared enoki mushroom & kani stick tempura snack, that's a sure crowd-pleaser. A delicious mixture of freshly fried enoki mushroom & otah tempura snack, that's a sure-hit for any occasion.